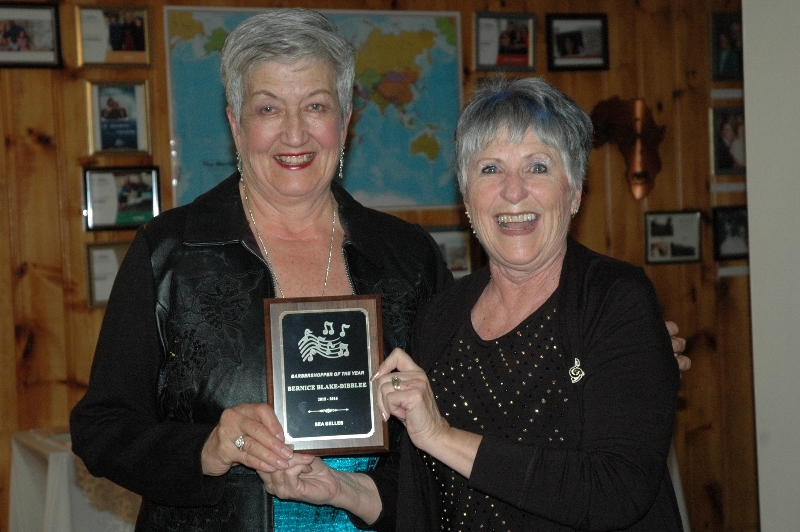 2016 Barbershopper of the Year recipient Bernice Blake- Dibblee ( on left) is presented with her award by Margie Fife, last year’s recipient. Sea Belles, Atlantic Canada’s number one ladies’ a cappella chorus, recently held a weekend music retreat with 10 year chorus director and 15 year Certified Music Judge and coach, Kathy Greason. The workshop was held to prepare for the June, 2016 Harmony, Inc. Area 1 Competition and Contest (ACC) in Sackville, NB. The highlight of the weekend was the presentation of the Barbershopper of the Year Award. Each year the chorus members secretly vote on who they feel has given the most of their time and energy to promote the chorus. Funding for this music retreat was provided by Sing Canada Harmony Scholarship Fund. Sing Canada Harmony is a registered Canadian charity that provides financial assistance to deserving Canadians of all ages through scholarships and grants for education and training in vocal music performance, vocal music leadership, conducting/ directing, vocal music administration and vocal music composition, arrangement, adjudication and staging. During the weekend retreat, new Chorus officers were also installed by weekend coach, Kathy Greason. New officers include President Susan Ingraham, Vice President Vangie Mofford, Secretary Cheryl Sweeney, Treasurer Mandie Nicholson, Past President Tracey Harkins, and Board members Cindy Mayo, Bernice Blake-Dibblee, Ann Connolly, Susan Rose, Gail Hughes, Karen Shonaman. Sea Belles will attend the Area 1 Contest and Convention June 2-4, 2016 at Mount Allison University in Sackville. The public is invited to hear choruses and quartets compete from across the Atlantic region. Sea Belles hope to remain the Area 1 Number one ladies’ a cappella chorus. Susan Rose liked this on Facebook. Helen Eisner LeFort liked this on Facebook. Elaine Boudreau liked this on Facebook. Sue King liked this on Facebook. Cynthia Mayo liked this on Facebook. Sandi Estabrooks liked this on Facebook.